The Berlin Zoo or “Tiergarten” opened in 1855 and was soon a popular attraction with families and visitors who came to observe strange and exotic species of animals. It is the oldest zoo in Germany and is located in the Tiergarten district of the city of Berlin. The zoo is currently home to over 20,000 animals. Although it still attracts visitors from all over the world, the emphasis is now on conservation rather than simply putting animals on display. It runs a number of successful conservation and breeding programs. In times of war, a zoo can be vulnerable to attack and also can be a source of danger for civilians. An attack on the zoo could not only lead to animals being killed, but also the additional risk of chaos if any of the animals, especially the more dangerous ones, escaped. 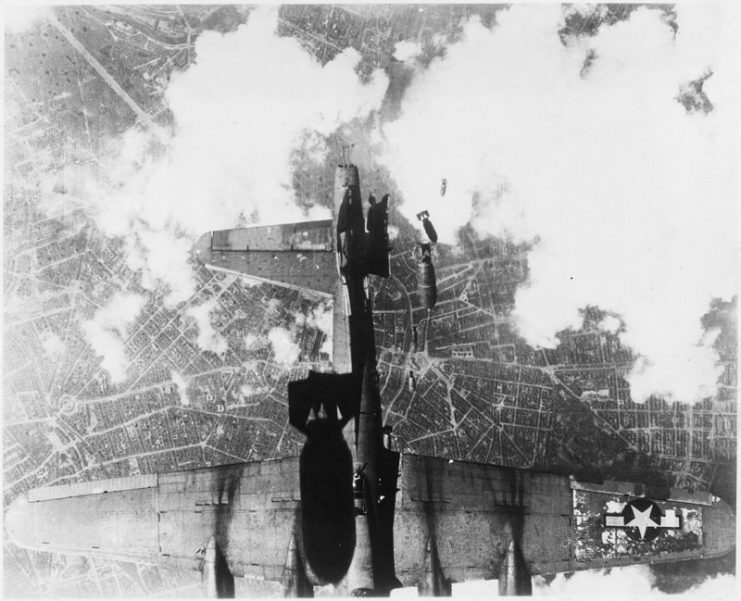 As Berlin increasingly became the focus of the Soviet bombing campaigns, steps were taken to deal with this possibility. 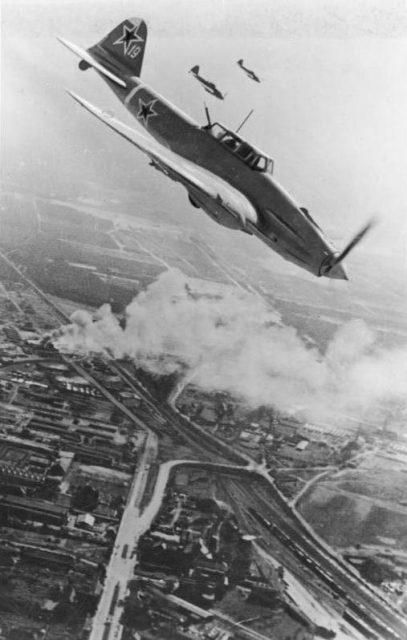 Three Russian aircraft Ilyushin Il-2 “Strumovik over Berlin during the Battle of Berlin. To reduce the risks, many of the animals were evacuated early in 1944. Some were taken to other zoos in less vulnerable parts of the country. Some of the smaller creatures were taken by individuals who had the space and the means to look after them. The anticipated bombing began later that same year. The first of several attacks on the zoo came on September 8, 1944. This was followed a few months later with further, more serious attacks. The worst of these took place on November 22, when Red Army bombs killed almost one-third of the animals in the zoo in one night. Another attack the following day hit the aquarium and completely destroyed it. The impact of the blast was so powerful that the bodies of some of the animal killed in the bombing were thrown into the streets. 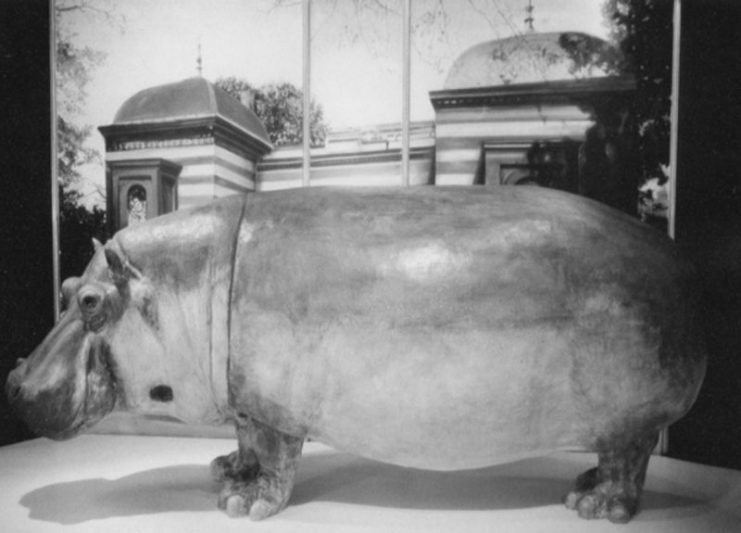 Some of the survivors of these two days of intensive bombing were a two-year-old hippo rescued from a fire in the animal house, as well as Saturn, the famous American alligator who was supposed to have been a favorite of Hitler. It is likely that Hitler visited the zoo and may have taken a particular interest in the creature, but the urban legend that he was “Hitler’s pet alligator” has little substance. Saturn was found by British soldiers after the war and given to the Soviets. Shortly afterward he was moved to the Moscow Zoo. He became one of the most popular exhibits, and to this day he still lives there. Another persistent myth is that the first bomb on September 8 killed the only elephant in the zoo. There were, in fact, eight elephants and a bull elephant called Siam was the only one of them to survive. 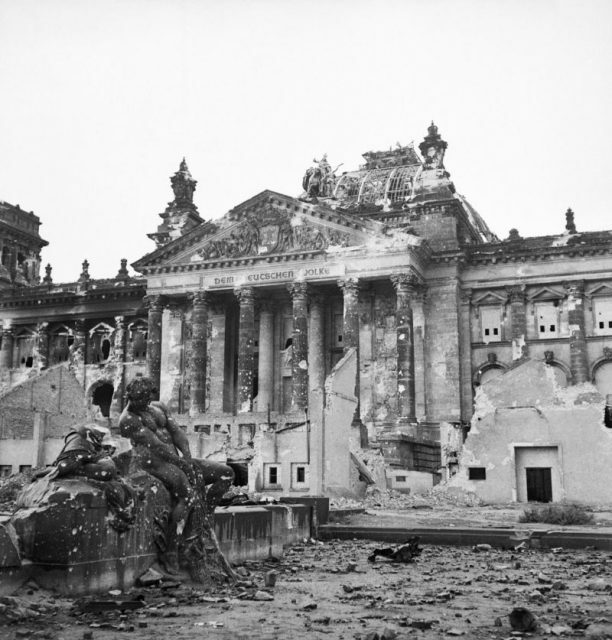 As the Battle of Berlin continued, it brought more destruction to the city and its inhabitants. Civilian casualties were estimated at more than 20,000 with many more being injured and made homeless. The zoo staff were becoming increasingly aware of the potential risks of animals escaping as the security of the building and fences were likely to be breached by further attacks. The zookeepers, who showed remarkable courage and dedication to the animals in their care throughout this time, made the difficult decision to shoot some of the more dangerous predators in the interests of safety. An important installation at the zoo was the Zoo Tower which was built to provide reinforcement and shelter. Several similar fortified towers were built in Berlin to protect public buildings. The Zoo tower in 1946. The tower at the zoo had a gun platform, and radio masts which made it an important center of communication. 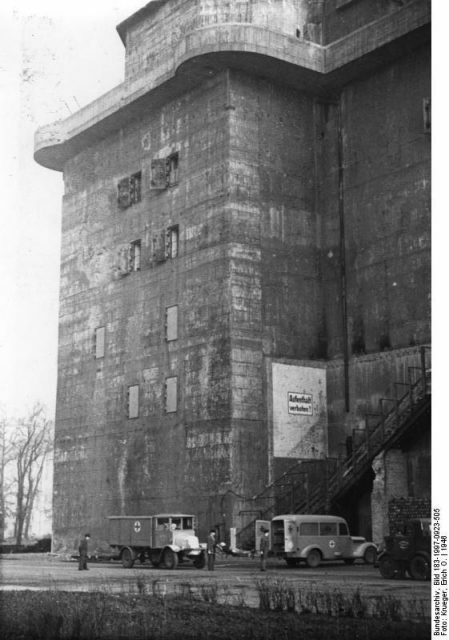 The tower was built above a network of underground bunkers that functioned as air raid shelters for civilians and also provided space for a hospital. At times, when there was a shortage of trained nurses much of the basic medical care was carried out by the zookeepers’ wives. The bunker was also was a hiding place for many of the state’s valuable art and treasures. 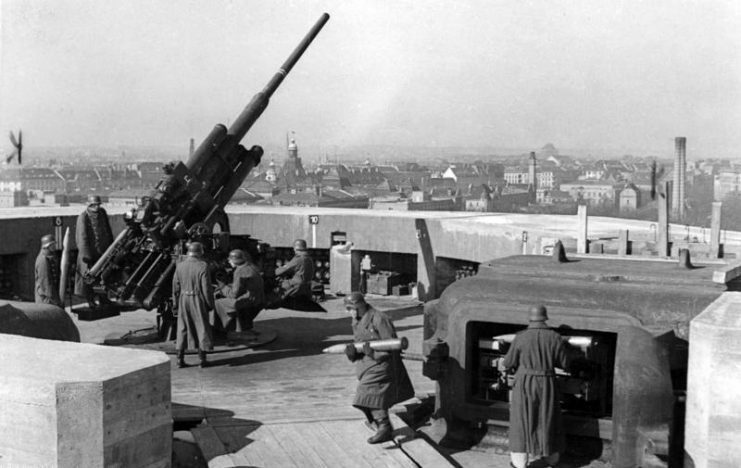 The Battle of Berlin was the decisive battle that brought final defeat for Germany. Hitler and his companions had already committed suicide by the time the battle began in earnest. 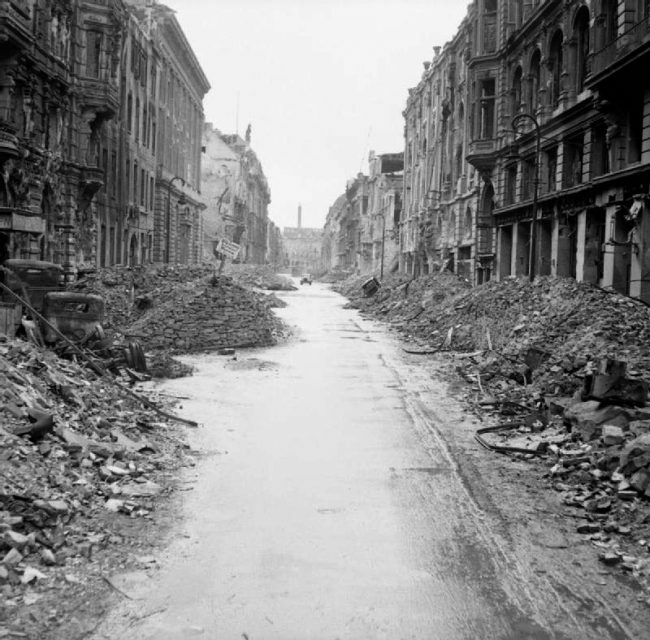 A devastated street in the Berlin city centre just off the Unter den Linden, 3 July 1945. Following the post-war division of Berlin, the Zoo was contained within West Berlin and a second new zoo was later created in East Berlin. In 1945 the war damage was reassessed as plans to restore the zoo were considered. Of the zoo’s former inhabitants only 91 out of over 4,000 animals remained. There was little left of the original structures. Of all the animals that had been evacuated before the bombing, only one giraffe returned. Some animals were now well-settled in new homes and it was thought best not to move them. Some had died of old age or natural causes or due to the war. 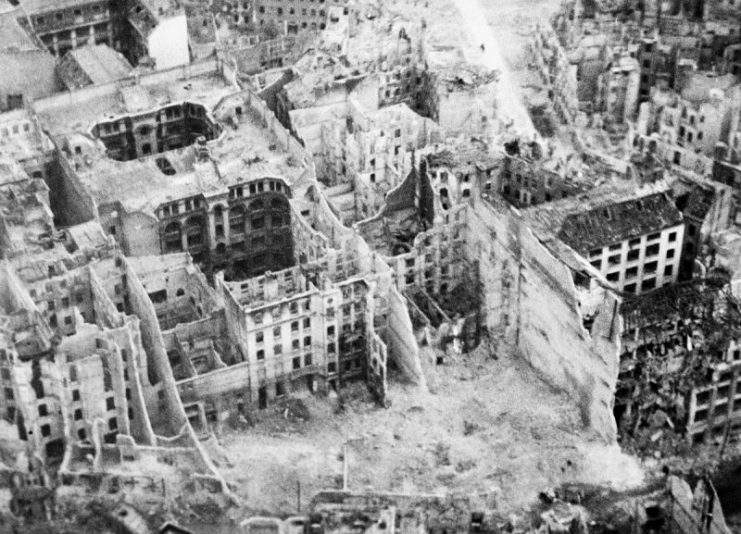 An aerial photograph of damaged buildings in Berlin 1945-1947. 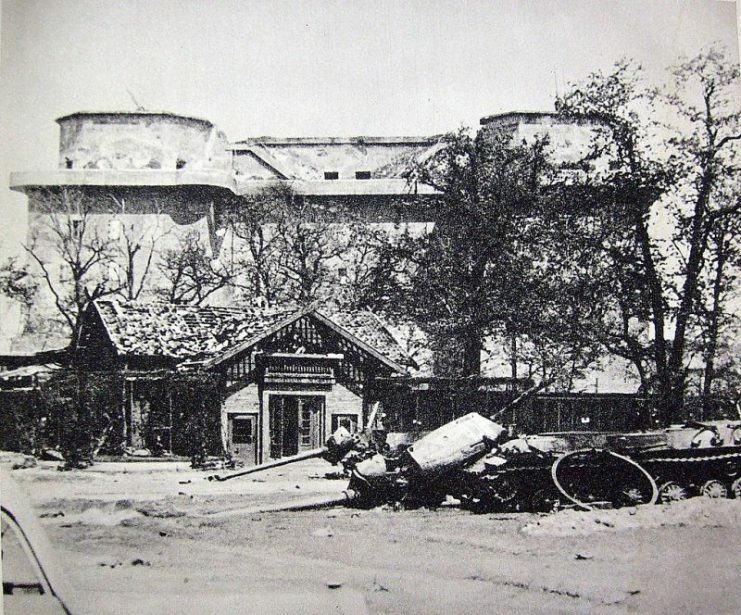 Other zoos had also been bombed, although not to the same extent, so that in the end some of the evacuated animals had met the same fate as their fellow creatures in Berlin. 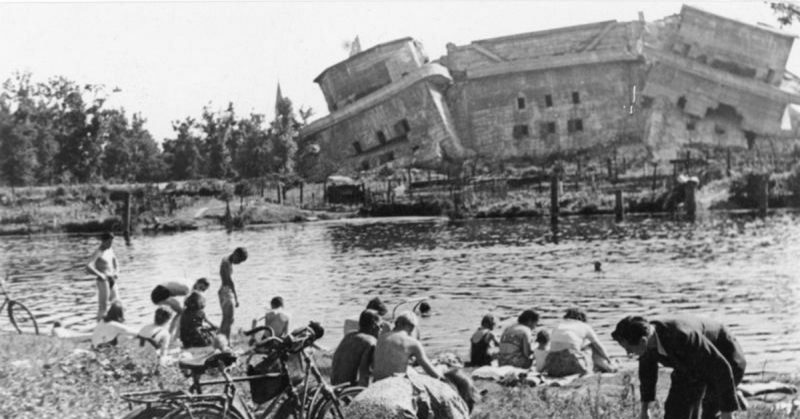 The destruction of the zoo presented the opportunity to rebuild it from the ground. Dr. Katherina Heinroth was appointed as its new director. Heinroth’s husband had previously been the director of the Zoo and she was the first woman to be appointed to such a role. Under her guidance, the zoo was rebuilt to incorporate new ideas about conservation. 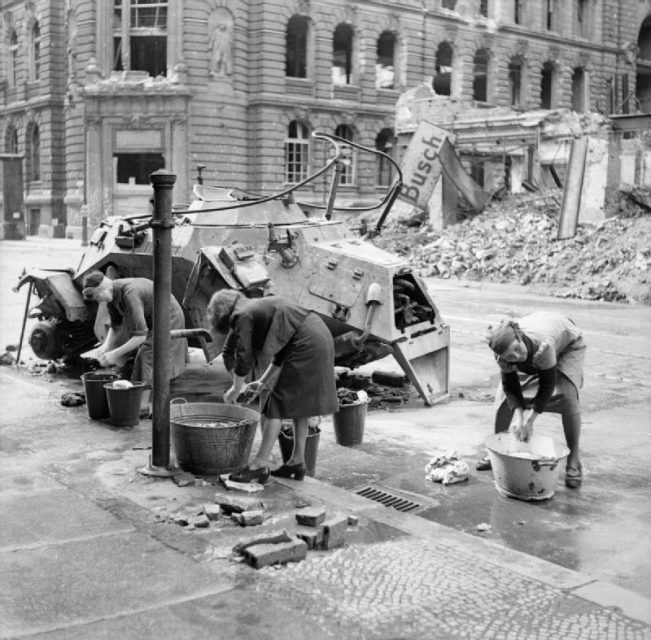 German women doing their washing at a cold water hydrant in a Berlin street, a knocked out German scout car stands beside them. The zoo remains a popular visitor attraction in the heart of modern Berlin and attracts more than 3.3 million visitors per year. It now houses over 20,000 animals representing around 1,500 different species. Many of these are rare and endangered species, such as giant pandas, and are part of the zoo’s breeding programs. Fortunately the animals’ living conditions today are far removed from the old cages of the original zoo, as the zoo now tries to replicate their natural habitats as closely as possible.